Extract from Henry Nelson Coleridge's 'Six months in the West Indies.' 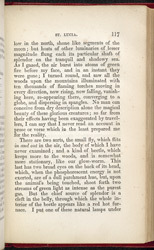 In this extract he describes the beautiful scenery of the island of St Lucia. He was fascinated by some of the insects he saw and writes about glow-worms and fireflies.